Berkeley Marsh Happy Hour. Only 2 Fridays left–Jan 18th and 25th! Experience something on Friday evening you’ll remember the rest of your life! I, Sebastian Boswell III, mentalist and entertainer, will be performing for 2 more shows at the Berkeley Marsh Happy Hour. 6pm on Friday 18th and Friday 25th. 2120 Allston Way. No cover charge, and your weekend will be better for it. 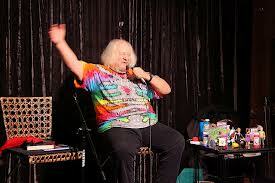 Last week there was a full house for my show, and then some went next door to see Mr. Wavy Gravy. Here is a photo of Mr. Gravy, waving.